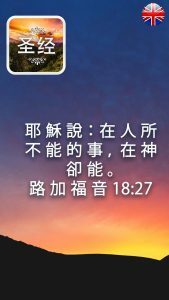 Today we offer a very easy-to-use and intuitive app to all the Chinese Christians. Download this app for free on the phone or tablet and enjoy the Bible online and offline. This app works also without an Internet connection. The Chinese Union Version (CUV) is the most important Chinese translation used by the evangelicals in China. This Bible was translated by a commission of theologians from many different Protestant denominations, using the English Revised Version as a basis. It was completed and published in 1919. Christianity in China has gained an important prestige and influence during the last 200 years and the number of Christians has increased in the late 1970s. There are more than 30 million of Christians in China today. Our mission is to spread the God’s Word and reach a growing number of Chinese Christians. It is so good to share the Holy Word with others! Know your plan in life and make better decisions with the Holy Bible. Download now!